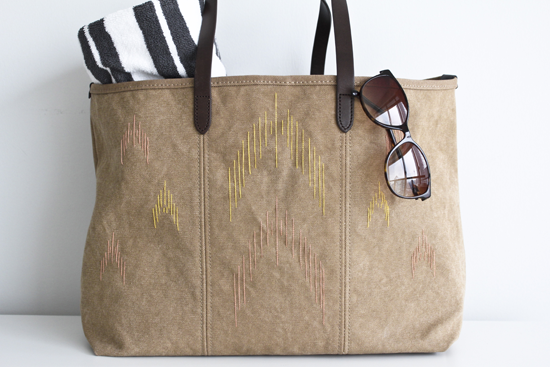 I've always been a bit crazy for Ikat and since it seems to be having its moment in the sun this summer I was inspired to customize my new beach bag with my own graphic interpretation. While this wasn't the fastest DIY that I've ever done it certainly was one of the easiest. 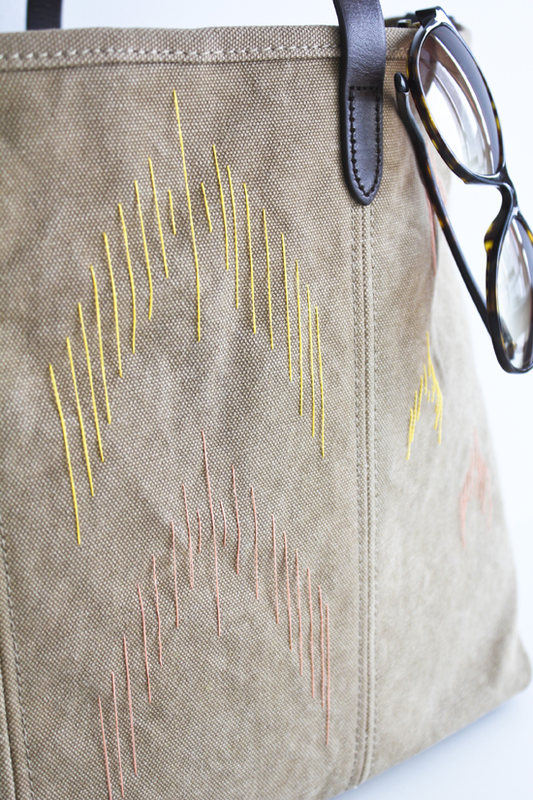 All you need is a canvas bag of your choice, thread(s), a needle, and a bit of embroidery-style stitching. You'll be working upside down (from the opening of the bag) so I suggest that you draw your main design on paper first for reference. Ikat is all about thread arrangements so play around and get creative! I used washi tape for the first few "shapes" to assist with alignment but after a few I was able to eyeball it. You could use tailors' chalk too if you don't mind rubbing it off later. As for keeping the lines straight, I found that bringing the needle and thread out from underneath (the inside of the bag) and then pulling it straight down to place the needle worked well. If it's not perfect, it's okay, slightly imperfect edges are the beauty of Ikat fabrics anyway. 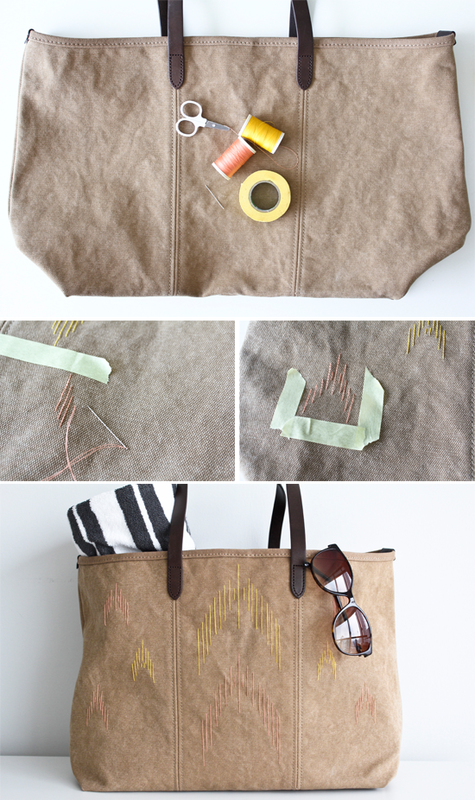 The great thing about this DIY is that you could do it on heavy-duty canvas bags like mine (purchased at MUJI) or on basic canvas totes that you can pick up at craft stores. Add your favorite summer colors with the thread and you've got a fun and unique way to carry your sunbathing essentials. An LA native living in Kuala Lumpur, Malaysia, Ana Maria is a flea market fanatic with a knack (and love) for DIY. She shares her vintage finds in her online shop,The Pond Market, and captures her adventures and inspirations on her personal lifestyle blog,Anamu. Thanks for sharing! Just popped in her blog and enjoyed. love this bag & what you've done with it!! would you happen to know what muji calls it?? I'm having trouble finding it online… thanks!! Ha! I was JUST this morning going through my giant dresser drawer of bags i don't really carry, but are too good to throw out/too scruffy to donate and wondering 1)Where the h*ll did I get all these canvas totes? and 2) What do I do with them? Now I can use all my old embroidery thread too! DIY is all about customizing, isn't it?! This is such a fun way to make an otherwise bland tote into something really special. It would also be a great way to make something special for someone you love! Glad you all got a little inspiration to do something special with the canvas totes in your lives! Perfect...I have so many neglected bags! I love the idea of a creative upcycle.